Kansas City, Mo. 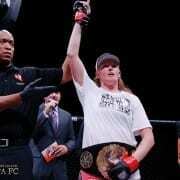 — Invicta Fighting Championships today announced a new addition to its bantamweight ranks. Undefeated fighter Pannie “Banzai” Kianzad (7-0) has joined the promotion to compete in the 135-pound division. The 23-year-old was born in Iran, but grew up in Sweden. She competed as an amateur boxer during her teenage years before switching her attention to MMA and turning pro in 2012. Fighting out of Rumble Sports in Copenhagen, Denmark, Kianzad has already beaten the likes of Milana Dudieva and Annalisa Bucci while competing in Europe. Three of her seven career wins have come via TKO. 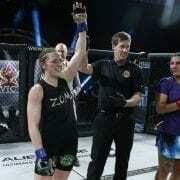 In her most recent outing, she captured the Cage Warriors bantamweight title by defeating Eeva Siiskonen. Look for Kianzad to make her Invicta debut in 2015.